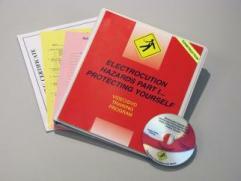 The second in a two-part series on electrocution hazards, MARCOM's Electrocution Hazards In Construction Environments PART II… Employer Requirements DVD Program discusses the major types of electrocution hazards, and how employees can protect themselves from electrical hazards and electrocution in construction environments, as well as employers' responsibilities in these areas. Construction sites can contain a number of potential electrical hazards. OSHA defines four types of hazards that are associated with electricity, and three types of injuries that result from them. Direct contact with electricity, through a power source, cord or transmission line is the most common type of electrical hazard, and can occur in a number of ways. Employers are required to train workers regarding electrocution hazards and the measures that they should take to control the hazards. Employers must also put procedures into place so that workers can get answers to any questions that they have about working safely around electrocution hazards. Topics covered in this program include electrical hazards and electrocution, power lines and isolation, tools and equipment, Assured Equipment Grounding Conductor Programs, lock-out/tag-out, employee training and more. The DVD program comes with a comprehensive leader's guide, reproducible scheduling & attendance form, employee quiz, training certificate and training log.